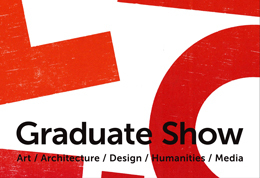 The University of Brighton’s annual Graduate Show is when our talented graduating students in the arts, design, architecture and media stage their final-year shows. The exhibition is open to the public every day from Saturday, 3 June to Sunday, 11 June. University Galleries at 58-67 Grand Parade, 154-155 Edward Street, Brighton. Our courses cover a range of disciplines and on show will be work from the following subject areas: architecture and interior architecture, fashion and textiles, film, fine art, photography, graphics and illustration, design, craft, media, history of art and design. See some selected students' stories of their work and journey towards the exhibition on our Art, Design and Media blog. Graduating students from the 3D Design & Craft course will be presenting the processes used to create the work displayed within the graduate show. This is a rare opportunity to visit the workshops within the city campus and view live demonstrations in wood, ceramics, metal, polymers and composites. The demos will be running for the duration of the day and visitors to the university are invited to tour the workshops and view the students at work.